Update 2013 - This place has new ownership and is no longer recommended by me or my Italian friends! 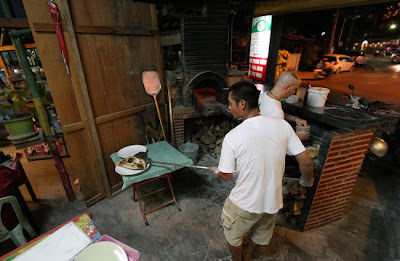 Try a place called Agli Amici in Chalong! Or Da Sandro in Kathu. I do like a bit of pizza now and then. Yes, I know this is Thailand, and I assure you that Thai food is my main diet, but this is Phuket, a great gathering place for tourists and expats from all over the world, and you can find just about any food you want here. 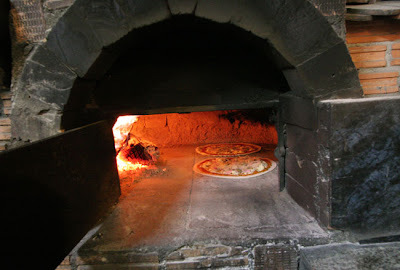 I am not an Italian food expert, but have been a couple of times to Italy, where a friend used to live on a small farm in Tuscany, and food was always fresh and plentiful, much of it being grown or made at the farm - breads, cheeses, vegetables, local wine, olive oil on everything, and they had a pizza oven too where we could cook our own pizza. Thin, crispy and fresh from the forno. Perfecto. Although not an Italian food guru, I would say I am a pizza snob :) I am sorry, but "Chicago Style" with half a loaf of bread as the base? Oh dear. No, I'm a thin and crispy guy. Got to be fresh, got to be made in a proper pizza oven. 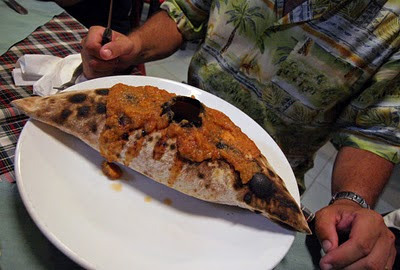 Phuket has quite a lot of Italian restaurants, quite a lot of Italian expats, and friends tell me of favourite places for pizza, so we might try some others sometime, only my wife does not eat pizza, and (for our pocket) dining out at a more touristy restaurant can be a bit expensive. The "Thai-Italy" restaurant is one of the few restaurants I would visit in Patong, being that Patong is not our kind of place. Thai-Italy is on Nanai Road (the back road) - coming from Karon Beach, turn onto Nanai road, over the slight hill, past the right turn that heads uphill (Hasip Pee Road), and on another 500m to the Mae Ubon Market on the left side - it's in there. Easy to see. It's not a big place, my friend Diego says it's really like a little local restaurant just like you'd find in a small Italian town. 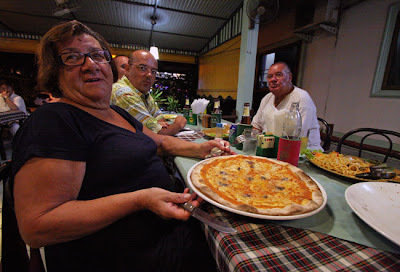 It's well known among expats, and most of the customers tend to be Italian, which is a good sign if you are looking for a good pizza or proper just-like-mama-makes-it pasta. The restaurant is normally only open in the evenings. We (the family) met Diego and family and a few more friends for dinner last Friday. Pizza was the top choice, but the menu has something like 4 pages of pasta options too. 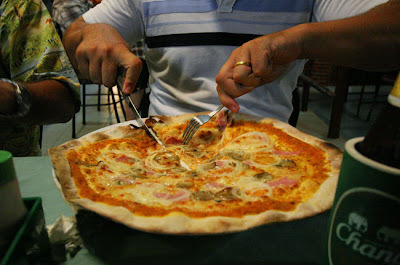 Prices very reasonable for this kind of food - my pizza diavola was 170 Baht. First to be served was Diego's Mama. If Mama likes the food, I can assure you, it's got to be good. All washed down with a few cold beers of course! And then coffee - I remember one time being in this restaurant, and an American customer ordered coffee. 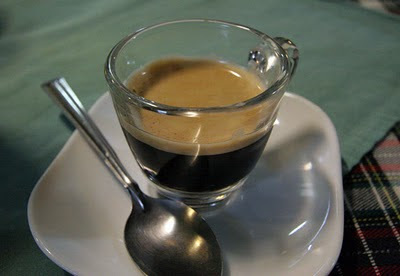 So, they brought him an Italian coffee, just like the one below that we had after our meal. American guy not impressed by tiny cup. He was all, hey what's this? It's coffee sir, real coffee. No, he wanted a cup of coffee, a big ol' cup of Americano.. Sorry, wrong place, this is little Italy, to order a Nescafe would be an insult! And the coffee was followed by a Sambuca, and then a Limoncello.. I turned down the Grappa (my belly does not like really strong alcohol). 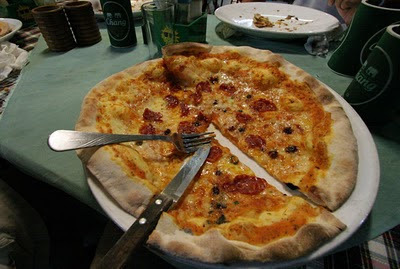 Ah, perfecto, full of pizza, a little buzz in the head from the sambuca, I do indeed like a bit of Italian. The Thai-Italy is busy every evening thanks to "word of mouth" advertising. No webpage, no mentions in guidebooks, but good food! Oh, just a note - it's closed on Mondays.